An enquiry from Julie Peck of Drouin about her grandparents, Herbert and Emma McConnell, was the spark that ignited a warming fire of historical research on a cool autumn night into the cottages at 53 – 63 Bridge Street, currently nearing the completion of an extensive renovation. Julie’s great grandparents William and Winifred Bolitho lived in 57 Bridge Street from 1900 until 1954 when Winifred passed away. William had died in 1946. Their daughter, Emma and her husband Herbert, moved into 59 Bridge Street in the late 1940s and remained there until the late 1960s. Fifty-nine Bridge Street is one of four cottages under a single roof known as Catherine Terrace. When they were built in 1889 there were five cottages but when they were last sold in 2016 there were only four. At some time the wall between 59 and 63, which abutted each other, (without a number 61), was broken through to create a larger dwelling with three bedrooms, rather than two. The life progress of the cottages is revealed in the Sands & McDougall directories and the Port Melbourne Valuation Books from 1888 onwards. In 1888, it was just vacant land owned by Thomas McCormack – no mention of the cottages. In 1890, there were five occupied cottages owned by McCormack, although they did not have street numbers at the time. The directory for 1890 was somewhat behind the times, as the cottages were referred to as being vacant. This implies that the cottages were built in 1889, since they were vacant when the 1890 Sands & McDougall was compiled but were all occupied by 9 December 1890 when the Valuation Book was signed off. The continuing development of Port Melbourne throughout the late 1880s and 1890s resulted in numerous changes to house numbering which was substantially revised in 1899/1900. After this the numbers of the cottages in Catherine Terrace became settled as 53 to 63. The first time that ‘Catherine Terrace’ appeared in the Sands & McDougall directory was in 1895. The heads of the first families to live in each cottage comes from the 1890 Valuation Book, (unfortunately the 1889 book has disappeared). They were: John Smythe – 53, Edwin Clarke – 55, Percy Inglis – 57, Ronald Cameron – 59 and James Waterman – 63. The name ‘Catherine Terrace’ was inspired by the Christian name of Catherine, who had married Thomas McCormack in 1854. Whilst Thomas began his life in Sandridge as a dairyman, he achieved success and became the owner and licensee of the Cricketers Arms Hotel, and lived in the two-storey house immediately behind the hotel. 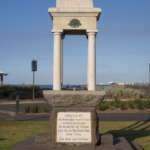 Thomas and Catherine’s family were hoteliers and prominent members of the Port Melbourne community for many years. When Thomas and Catherine died in 1891, they left a sizeable property portfolio, particularly in Port Melbourne. However, the properties were not offered for sale until 1900. Their son James took over Catherine Terrace at this time. James owned Catherine Terrace until 1959 when it was sold after his death to Robert and Ella Atkinson who were living in 53 at the time. 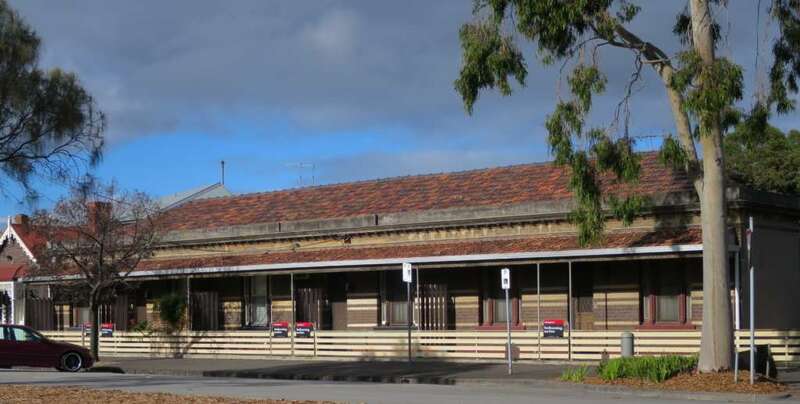 Catherine Terrace was constructed immediately before the land boom that had engulfed much of South East Australia in the 1880s came to a calamitous end. Thomas and Catherine were very much a part of it with their family connections. Catherine, whose maiden name was Larkin, was from evidence of research, most probably the cousin of Matthias Larkin. 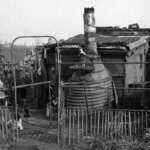 He was convicted in 1892 of defrauding the South Melbourne Permanent Building and Investment Society and Deposit Institute of about £100,000 and sent to Pentridge for seven years. Both Matthias and Catherine had arrived in the Colony of Victoria on the Stebonheath in December 1851. Matthias was one of the executors for both Thomas and Catherine. Matthias Larkin also wrote the first two mortgages for 321 Esplanade East, the subject of my book 321 Imagined Settlement. A photograph of the backyard of 53 Bridge St featured an Aldo rotary clothes hoist that had been made by my father. 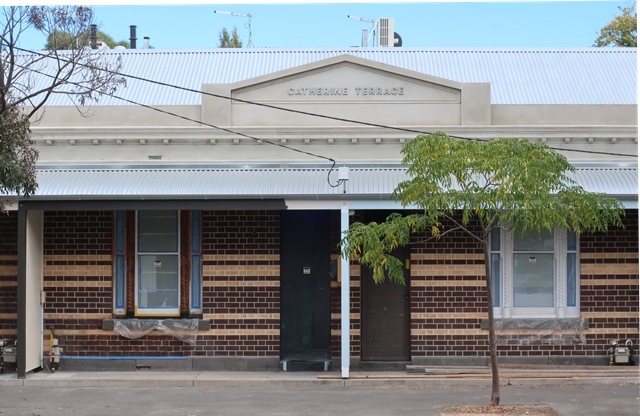 The Catherine Terrace cottages were, like so many others in Port Melbourne, occupied by people of unskilled or semi-skilled occupations for the years from 1890 to 1974. However, this is expected to change following the transformation that these simple cottages are undergoing at present. Another demonstration of just how the Port Melbourne demographic has changed over the years. If anyone has photos of the original fences that graced Catherine Terrace the Society and the developer would just love to see them, so they can be replicated. Words cannot describe how truly grateful I am for this information and the photos.It means so much to myself and my family. I am looking forward to meeting you in person in around a months time. What a beautifully written article. I am really moved and I can’t wait to show my Mum, Judith.